What Is VA Form 21-22? VA Form 21-22, Appointment of Veterans Service Organization as Claimant's Representative, sometimes referred to as the VA Power of Attorney Form 21-22, is used if you prefer to have a service organization assist you with your claim. The Department of Veterans Affairs (VA) does not recognize the Powers of Attorney for the purposes of prosecuting a VA claim. In order to be recognized by the VA, a claimant's representative must be appointed according to the VA guidelines. The form was released in August 2015 with several new features introduced to the electronic version of the form in February 2017. An up-to-date VA Form 21-22 fillable version is available for digital filing and can be downloaded below. It can also be found on the VA website. What Is Va Form 21-22 Used For? How To Fill Out Va Form 21-22? How To Revoke Va Form 21-22? Representative." VA Forms are available at www.va.gov/vaforms. IMPORTANT - PLEASE READ THE PRIVACY ACT AND RESPONDENT BURDEN ON REVERSE BEFORE COMPLETING THE FORM. 12. AUTHORIZATION FOR REPRESENTATIVE'S ACCESS TO RECORDS PROTECTED BY SECTION 7332, TITLE 38, U.S.C. treatment for drug abuse, alcoholism or alcohol abuse, infection with the human immunodeficiency virus (HIV), or sickle cell anemia. the appointment of the service organization named above, either by explicit revocation or the appointment of another representative. to change my address in my VA records. organization named in Item 3A is not my appointed fiduciary. prosecution of your claim before the Department of Veterans Affairs in connection with your claim or any portion thereof. Membership in an organization is not a prerequisite to appointment of the organization as claimant's representative. presentation, and prosecution of claims under laws administered by the Department of Veterans Affairs. American Ex-Prisoners of War, Inc.
Swords to Plowshares, Veterans Rights Organization, Inc. The Veterans Assistance Foundation, Inc.
Italian American War Veterans of the United States, Inc.
Veterans of World War I of the U.S.A., Inc.
1-800-827-1000 to get information on where to send comments or suggestions about this form. While applying for VA benefits, a service member or a veteran can get help from a Veteran Service Organization (VSO). It is a veterans association that provides assistance for service members on terminal leave, veterans and their families in applying for VA benefits. The list of VSOs is included in the VA 21-22 form. The form is a legitimate agreement between a claimant and an agency or a Service Organization, such as the Veterans of Foreign Wars (VFW), The American Legion or Vietnam Veterans of America, for a purpose of the permission to represent a veteran, to prepare and prosecute a claim before the VA.
After the form is been signed, the authorized party has access to the veteran's VA file and medical records. They can represent the veteran in court and at medical facilities. There is a similar form called the VA Form 21-22A or "Appointment of Attorney or Agent as Claimant's Representative", for attorneys and agents, who may charge a fee for their services. No one can obtain information on a claim skipping filing one of these forms (also called a "third party authorization form"), as all of them contain the veteran's consent. try using your Social Security Number, it works even if a file number is different. the form should be submitted to the appropriate VA office. check the box to verify authorization and give consent to disclose medical records if needed. signature of a representative acting on behalf of the service organization with the date. Filing Box 3B of VA Form 21-22 is optional. If completed, there is no need to verify that the specific representative listed in the box 3B is accredited. 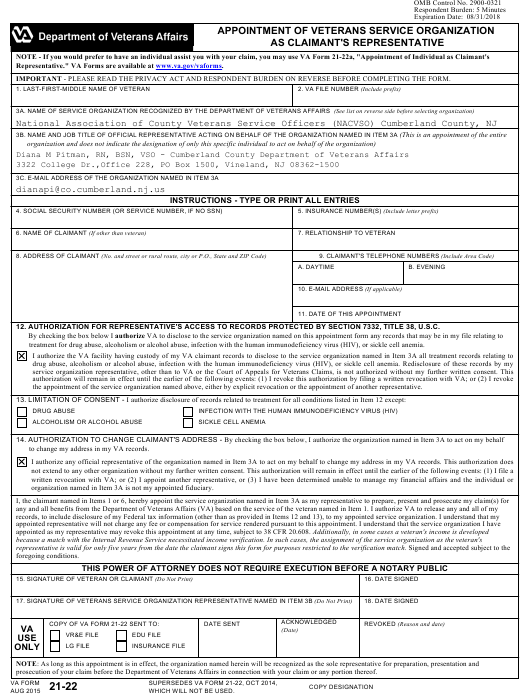 This form documents the appointment of the entire service organization listed in the Box 3A and does not limit action to a specific representative within the organization. The VA 21-22 Form can be revoked at any time, and an agent or attorney may be discharged at any time. Unless a claimant specifically indicates otherwise, the receipt of a new POA completed by the claimant shall constitute a cancellation of an existing one. The form is revoked by filing a written revocation with the VA. Fill out the VA 21-4138 Form to indicate that the current VSO representative is no longer requires as the veterans representative. A copy of the statement should be submitted by mail or hand delivery to both VA and the current representative. Another copy is kept by the claimant. A new representative will probably want to review a claim carefully to offer the best guidance; this may take some time. Some VSO do not take representation when an appeal is active at the Board of Veterans Appeals.